He was a priest of Chigenji Temple in Kozuke. His real priest name was Den-i Koun. After the Battle of Unnodaira, the Shigeno clan escaped to Kozuke depending on Kanto Kanrei UESUGI Norimasa. SANADA Yukitaka, the head of the Sanada Family, a side line of the clan then stayed at Chogenji and they became to know each other. In 1546 or 1546, Yukitaka served TAKEDA Harunobu (Shingen) and invites him to Shinano to establish Sanada-yama Chokokuji Temple, family temple of the Sanadas. He dies in 1573. "The Sanadas were once destroyed. But those who once died never die again." From this kind of the circumstance, the design of the Sanadas' emblem was changed into a design of the coins. He attends at the ceremony that Yukitaka becomes a priest later. (*) In Japan, the coins are burial accessories and is thought to be a fee for a boat to cross Sanzu no kawa, that is similar to the Styx. UESUGI Norimasa was a Kanto Kanrei, official of the Muromachi Government who assisted Kamakura Kubo who governed the shugos in Eastern Japan. But later Kanto Kanrei became to control them instead. He was born in 1523 as a son of UESUGI Norifusa and took office in 1531 thanks to some rulers in Kanto region. Though his authority influenced some daimyos, the Hojos invaded into his territory and fought against his army in the Siege of Kawagoe Castle. Then he was defeated by the army of ITAGAKI Nobukata and AMARI Torayasu both of whom served TAKEDA Harunobu (Shingen). Besides he was betrayed by some vassals and forced to escape to Echigo and he was protected by NAGAO Kagetora, later Uesugi Kenshin. Though he was protected by Kagetora, his son Tatsuwakamaru was taken to Sagami by his vassals who betrayed him. And Tatsuwakamaru was executed by HOJO Ujiyasu. In 1561, Norimasa adopted Kagetora and then he succeeded Kanto Kanrei and called himself Uesugi Masatora. After that Norimasa became a priest and called himself Kotetsu. Masatora (Kenshin) died in 1578 and a dispute over succession (Otate no ran, the Siege of Otate) broke out. He took the side of Kagetora (*), adopted son of Masatora but Kagekatsu, nephew of Masatora succeeded the Uesugi clan at last. He is said to have killed or committed suicide after the dispute. In this series, he is described as a proud and conservative man but lacks ruling power. He loves giving himself up to pleasure and enjoys the dance of prostitutes and drinks heavily even during the Siege of Kawagoe Castle. And he does not drop the habit in Echigo. When Kagetora becomes new Kanto Kanrei, he makes an inappropriate remark concerning his policy and is refused by him. (*) Though being called Kagetora, he was a son of HOJO Ujiyasu and adopted by Masatora. TAKEDA Shingen now conquers Totomi and advances to Mikawa. Nankei meets him and says that the Iis hope to restore the family. Then he tells Shingen that he wonders why he doesn't gets tired of fighting but he answers that he has no time for thinking such a thing. And in Kawana, Ryuunmaru says that why Takese didin't escape from the residence of the Iis at once. Then O-Towa realises that she is a spy because she brings him a bowl of tisane that is poisoned. She became a spy of the Takedas because of the debts her dead mother left but O-Towa says she should not do so any more. And Shingen writes to her that she and the villagers of Ii-no-ya can go home instead of the head of KONDO Yasumochi. O-Towa talks to Yasumochi about it and says that she will not behead him and let them pretend to oppose each other. They return to Ii-no-ya to rebuild the burnt village but Ryuunmaru and NAKAMURAYA Yodayu appears there. Yodayu visits Ii-no-ya to take O-Towa and him to Sakai by water. O-Towa is going to travel to Sakai with Ryuunmaru but finds it hard to tear herself away from Ii-no-ya. So Ryuunmaru behave rudely on purpose and leaves her there. At that time, Shingen sees an illusion of Jukeini at his base then vomits blood and died. Thanks to his death, TOKUGAWA Ieyasu recovers Mikawa and the western part of Totomi. The year 1574 has come and the Buddhist service of the 13th death anniversary of Naochika is held at Ryotanji temple. The Relatives of him includes MATSUSHITA Toramatsu who grows up into a fine young man are there. (*) The tiele may be a parody of "Kaze to tomo ni sarinu", Japanese title of "Gone with the Wind". In 1545, Yu-u hime tells Kansuke who visits Suwa that she is pregnant. She becomes calm and it makes Kansuke happy. But at that time, MURAKAMI Yoshikiyo says that TAKEDA Harunobu will retreat from Shinano where he invades into and dispatch troops to Suruga. 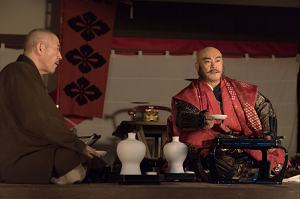 As IMAGAWA Yoshimoto,who allies himself with Harunobu and HOJO Ujiyasu are in a touch-and-go situation over the possession of the eastern part of Fuji River, he should send reinforcements to Yoshimoto. Oyamada Nobuari (Seiichi Tanabe, right) bring Taigen Sofu Sessai (Masato Ibu) to Tsutsujigasaki. Then OYAMADA Nobuari, who rules the region near Suruga brings TAIGEN Sofu Sessai to the residence of Tsutsujigasaki. He asks Harunobu for advice on how the Imagawas should do. 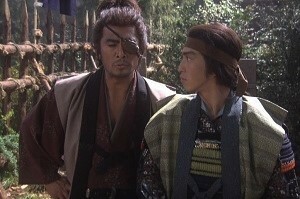 After his leave, Nobuari insists that Harunobu should make peace with the Hojos first. But Kansuke advises Harunobu to make both reconcile and gain their gratitude. Though Nobuari seems to be dissatisfied, Harunobu agrees with it. 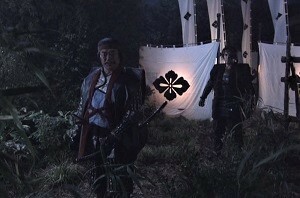 Kansuke sees IHARA Yukimasa at Zentokuji Castle, the headquarters of the Imagawas. Yukimasa tells him that Sessai is not keen on fighting against the Hojos in reality. Then Kansuke meets Sessai and then Yoshimoto. Kansuke tells him that Harunobu plans to make both armies retreat from there and in that case, the place still belong to the Imagawas. But Yoshimoto says that the Takedas have no right to do that. However, Yoshimoto realises his words there is nothing to gain by triumphing the Hojos. But he tells Kansuke that he is unsuited to be present at submitting a written vow. Then Harunobu sends KOMAI Masatake, one of his heredity vassals. 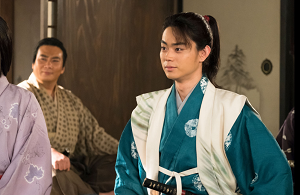 And in the headquarters of the Takedas, Kansuke tells Nobuari that everything was planned by Sessai. Sessai told Kansuke that he had a good lord when he left and only Harunobu realises what he really meant. In the headquarters, he finds ITAGAKI Nobukata and he asks him whether he plans to deceive Harunobu with Yu-u hime or not. Kansuke refuses it strongly and he says he admires Harunobu, Yu-u hime and Nobukata respectively as if a human loves his province. Nobukata sees what kind of man he is by his words. He and Kansuke departs fot Yoshiwara Castle where the Hojos are based. 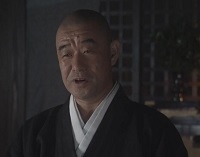 Hojo Ujiyasu remembers him and Nobukata tells him that it's Kansuke who informed him the reconciliation. Ujiyasu says that he was right because he didn't employ him (*). Then Yoshimoto sees the sea with Harunobu who is long to have sea in his territory. 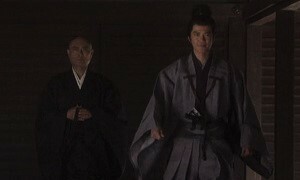 And Kansuke marches to Kawagoe, Musashi with a certain purpose. (*) He means that such a brilliant vassal will run away to another lord soon. The images are from the video of "Furin Kazan".